Please refer to our licensing agreement for permission to use IRI ENSO materials. The CPC/IRI materials are not included in this licensing. SSTs in the tropical Pacific maintained a weak El Niño level during March and early April, while temperature anomalies of subsurface waters decreased somewhat but continued to be positive. Patterns in the atmosphere show weak El Niño conditions. Collective model forecasts show a continuation of at least weak El Niño-level SSTs lasting through 2019. The somewhat more cautious official CPC/IRI outlook, with an El Niño advisory, calls for an approximate 65% chance of El Niño prevailing during Jun-Aug, decreasing to 50-55% for Sep-Nov. Figures 1 and 3 (the official ENSO probability forecast and the objective model-based ENSO probability forecast, respectively) are often quite similar. However, occasionally they may differ noticeably. There can be several reasons for differences. One possible reason is that the human forecasters, using their experience and judgment, may disagree to some degree with the models, which may have known biases. Another reason is related to the fact that the models are not run at the same time that the forecasters make their assessment, so that the starting ENSO conditions may be slightly different between the two times. The charts on this Quick Look page are updated at two different times of the month, so that between the second and the third Thursday of the month, the official forecast (Fig. 1) has just been updated, while the model-based forecasts (Figs. 3 and 4) are still from the third Thursday of the previous month. On the other hand, from the third Thursday of the month until the second Thursday of the next month, the model-based forecasts are more recently updated, while the official forecasts remain from the second Thursday of the current month. Click on the for more information on each figure. Synopsis: A weak El Niño is likely to continue through the Northern Hemisphere summer 2019 (65% chance) and possibly fall (50-55% chance). 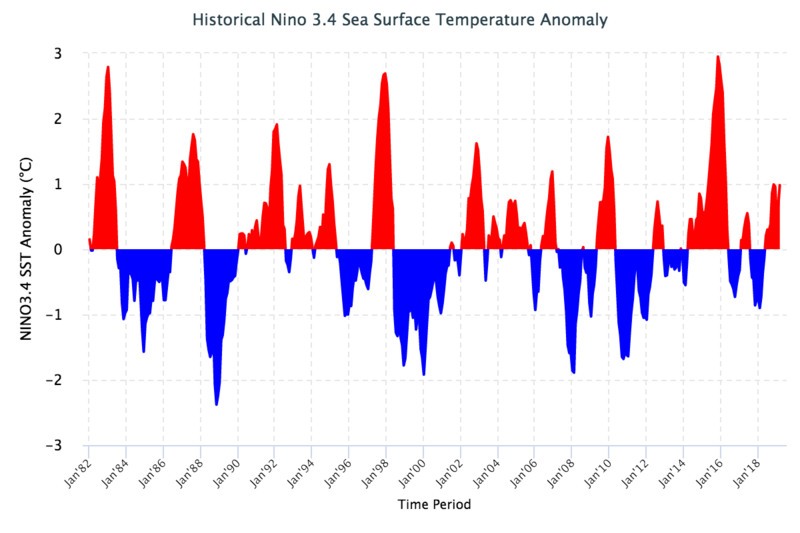 El Niño continued during March 2019, as above-average sea surface temperatures (SSTs) persisted across the equatorial Pacific Ocean (Fig. 1). The latest weekly values of the Niño3 and Niño4 indices were +0.8°C, while the Niño3.4 value was +0.9°C (Fig. 2). The anomalous upper-ocean heat content (averaged across 180°-100°W) decreased during March but remained well above average (Fig. 3), as the above-average temperatures at depth peaked in early March in association with a downwelling equatorial oceanic Kelvin wave(Fig. 4). Enhanced equatorial convection was observed near the Date Line and in the western Pacific, while suppressed convection prevailed over western Indonesia (Fig. 5). Low-level wind anomalies were westerly in the western Pacific Ocean during March. Meanwhile, upper-level winds were mostly near average. The equatorial and traditional Southern Oscillation Index values were negative. Overall, these features are consistent with a weak El Niño. 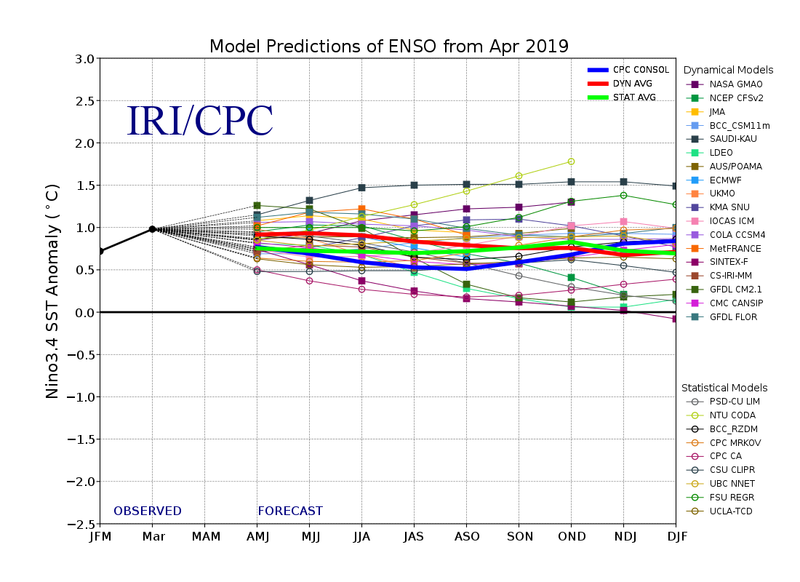 The majority of models in the IRI/CPC plume predict a Niño 3.4 index of +0.5°C or greater through the remainder of 2019 (Fig. 6). Most forecasters expect SST anomalies in the Niño 3.4 region to remain between +0.5°C and +1.0°C for at least the next several seasons, indicating a weak El Niño. However, because forecasts made during spring tend to be less accurate, the predicted chance that El Niño will persist through fall is currently 50-55%. In summary, a weak El Niño is likely to continue through the Northern Hemisphere summer 2019 (65% chance) and possibly fall (50-55% chance); click the CPC/IRI consensus forecast for the chance of each outcome for each 3-month period). This discussion is a consolidated effort of the National Oceanic and Atmospheric Administration (NOAA), NOAA’s National Weather Service, and their funded institutions. Oceanic and atmospheric conditions are updated weekly on the Climate Prediction Center web site (El Niño/La Niña Current Conditions and Expert Discussions). Forecasts are also updated monthly in the Forecast Forum section of CPC’s Climate Diagnostics Bulletin. Additional perspectives and analysis are also available in an ENSO blog. The next ENSO Diagnostics Discussion is scheduled for 9 May 2019. To receive an e-mail notification when the monthly ENSO Diagnostic Discussions are released, please send an e-mail message to: ncep.list.enso-update@noaa.gov. Note: The SST anomalies cited below refer to the OISSTv2 SST data set, and not ERSSTv4. OISSTv2 is often used for real-time analysis and model initialization, while ERSSTv4 is used for retrospective official ENSO diagnosis because it is more homogeneous over time, allowing for more accurate comparisons among ENSO events that are years apart. During ENSO events, OISSTv2 often shows stronger anomalies than ERSSTv4, and during very strong events the two datasets may differ by as much as 0.5 C. Additionally, the ERSSTv4 may tend to be cooler than OISSTv2, because ERSSTv4 is expressed relative to a base period that is updated every 5 years, while the base period of OISSTv2 is updated every 10 years and so, half of the time, is based on a slightly older period and does not account as much for the slow warming trend in the tropical Pacific SST. In mid-April 2019, weak El Niño SST conditions were observed in the NINO3.4 region. The March SST anomaly was 0.98 C, at the “top” of the weak El Niño range, and for Jan-Mar it was 0.72 C, also indicative of a weak El Niño. The IRI’s definition of El Niño, like NOAA/Climate Prediction Center’s, requires that the SST anomaly in the Nino3.4 region (5S-5N; 170W-120W) exceed 0.5 C. Similarly, for La Niña, the anomaly must be -0.5 C or less. The climatological probabilities for La Niña, neutral, and El Niño conditions vary seasonally, and are shown in a table at the bottom of this page for each 3-month season. The most recent weekly anomaly in the Nino3.4 region was 0.9 C, indicating weak El Niño conditions. Since late February, SSTs became more strongly positive in the east-central tropical Pacific, initiated in part to a downwelling Kelvin wave at that time. Also, in late January some important atmospheric variables finally became El Niño-like, including westerly low-level zonal wind anomalies and above-average convection near the dateline. In the latest several weeks, however, the atmospheric variables weakened somewhat in their conformity to patterns expected during El Niño. Still, a coupling of the atmosphere to the oceanic conditions is sufficient to support a weak El Niño. The subsurface temperature anomalies across the eastern equatorial Pacific became more strongly above-average in February, but have weakened somewhat during later March and early April. These warmed waters at depth extend to the surface, presaging likely continuation of above-average SST in the coming couple of months or longer. What is the outlook for the ENSO status going forward? The most recent official diagnosis and outlook was issued approximately one week ago in the NOAA/Climate Prediction Center ENSO Diagnostic Discussion, produced jointly by CPC and IRI; it gave a 65% chance for El Niño for this northern summer season, dropping to 50-55% for fall season. An El Niño advisory is in effect. 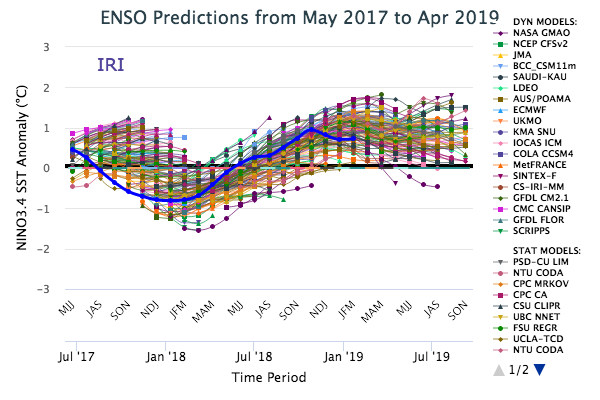 The latest set of model ENSO predictions, from mid-April, now available in the IRI/CPC ENSO prediction plume, is next discussed. 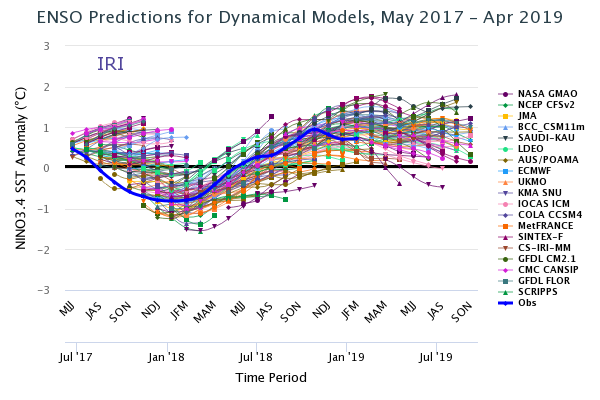 As of mid-April, more than 90% of the dynamical or statistical models predict El Niño conditions for the Apr-Jun and May-Jul seasons. 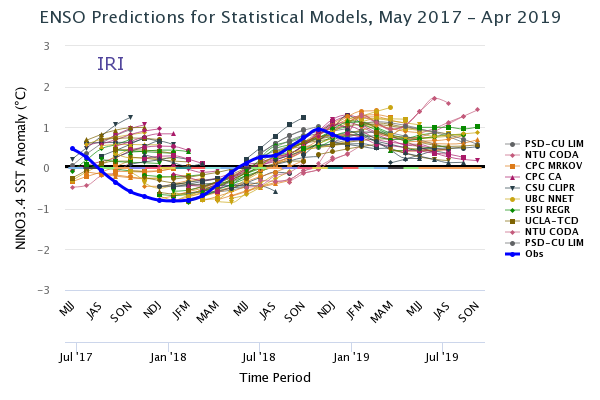 After May-Jul, the percentage of models forecasting El Niño gradually decreases, dropping to 70-79% for Sep-Nov and Oct-Dec and to near 65% for Nov-Jan and Dec-Feb. No model predicts La Niña for any season. Note – Only models that produce a new ENSO prediction every month are included in the above statement. Caution is advised in interpreting the distribution of model predictions as the actual probabilities. At longer leads, the skill of the models degrades, and skill uncertainty must be convolved with the uncertainties from initial conditions and differing model physics, leading to more climatological probabilities in the long-lead ENSO Outlook than might be suggested by the suite of models. Furthermore, the expected skill of one model versus another has not been established using uniform validation procedures, which may cause a difference in the true probability distribution from that taken verbatim from the raw model predictions. An alternative way to assess the probabilities of the three possible ENSO conditions is more quantitatively precise and less vulnerable to sampling errors than the categorical tallying method used above. This alternative method uses the mean of the predictions of all models on the plume, equally weighted, and constructs a standard error function centered on that mean. The standard error is Gaussian in shape, and has its width determined by an estimate of overall expected model skill for the season of the year and the lead time. Higher skill results in a relatively narrower error distribution, while low skill results in an error distribution with width approaching that of the historical observed distribution. This method shows probabilities for La Niña at near 0% from Apr-Jun through Jun-Aug, rising only to 7% by Sep-Nov and to near 10% for Oct-Dec through Dec-Feb. Probabilities for neutral conditions begin at 5% for Apr-Jun, rise to 25% for Jun-Aug, and and then settle at close to 30% from Aug-Oct through Dec-Feb. Probabilities for El Niño begin at 95% for Apr-Jun, thereafter declining to 83% for May-Jul, 69% for Jul-Sep, and near 60% for Sep-Nov through Dec-Feb. The failure to drop below 50% throughout 2019 suggests a possibility for a two-year El Niño event, but at this time, with the northern spring predictability barrier upon us, this idea is mainly speculative. A plot of the probabilities generated from this most recent IRI/CPC ENSO prediction plume using the multi-model mean and the Gaussian standard error method summarizes the model consensus out to about 10 months into the future. The same cautions mentioned above for the distributional count of model predictions apply to this Gaussian standard error method of inferring probabilities, due to differing model biases and skills. In particular, this approach considers only the mean of the predictions, and not the total range across the models, nor the ensemble range within individual models. 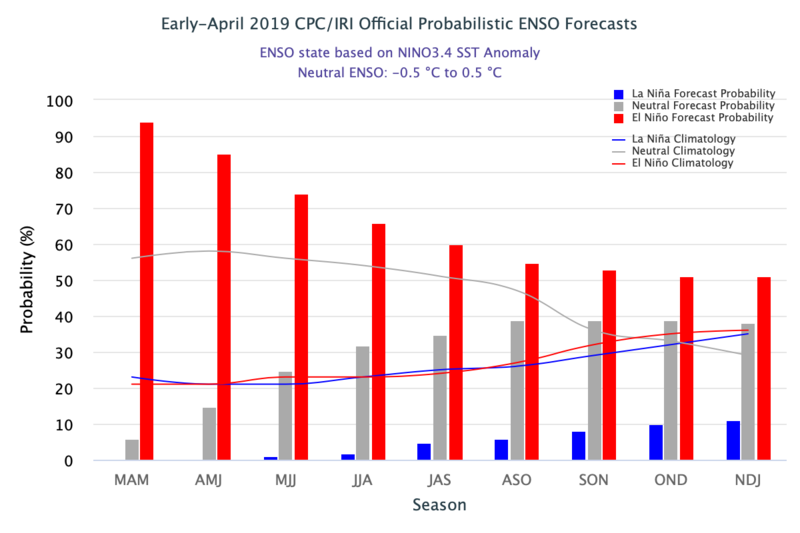 In summary, the probabilities derived from the models on the IRI/CPC plume describe, on average, a substantial tilt of the odds toward El Niño conditions from Apr-Jun through Jun-Aug 2019, becoming weaker but still at least about 60% through the final Dec-Feb season. Probabilities for La Niña are close to zero through Jul-Sep. A caution regarding this latest set of model-based ENSO plume predictions, is that factors such as known specific model biases and recent changes that the models may have missed will be taken into account in the next official outlook to be generated and issued early next month by CPC and IRI, which will include some human judgment in combination with the model guidance. A purely objective ENSO probability forecast, based on regression, using as input the model predictions from the plume of dynamical and statistical forecasts shown in the ENSO Predictions Plume. Each of the forecasts is weighted equally. It is updated near or just after the middle of the month, using forecasts from the plume models that are run in the first half of the month. It does not use any human interpretation or judgment. This is updated on the third Thursday of the month. The official CPC/IRI ENSO probability forecast, based on a consensus of CPC and IRI forecasters. It is updated during the first half of the month, in association with the official CPC/IRI ENSO Diagnostic Discussion. It is based on observational and predictive information from early in the month and from the previous month. It uses human judgment in addition to model output, while the forecast shown in the Model-Based Probabilistic ENSO Forecast relies solely on model output. This is updated on the second Thursday of every month. The following graph and table show forecasts made by dynamical and statistical models for SST in the Nino 3.4 region for nine overlapping 3-month periods. Note that the expected skills of the models, based on historical performance, are not equal to one another. The skills also generally decrease as the lead time increases. Thirdly, forecasts made at some times of the year generally have higher skill than forecasts made at other times of the year--namely, they are better when made between June and December than when they are made between February and May. Differences among the forecasts of the models reflect both differences in model design, and actual uncertainty in the forecast of the possible future SST scenario. Because of occasional data corrections and late model runs following the time of ENSO product issuance, the data shown in the ENSO forecast table and the ENSO plume graph may not always match. The best source of the ENSO forecast data is http://iri.columbia.edu/~forecast/ensofcst/Data/ensofcst_ALLtoMMYY where MM is the month number and YY is the year. The following plots show the model forecasts issued not only from the current month (as in the plot above), but also from the 21 months previous to this month. The observations are also shown up to the most recently completed 3-month period. The plots allow comparison of plumes from the previous start times, or examination of the forecast behavior of a given model over time. The first plot shows forecasts for dynamical models, the second for statistical models, and the third for all models. For less difficult readability, forecasts are shown to a maximum of only the first five lead times. Below the third plot, we provide a mechanism for highlighting the forecasts of one model at a time against a background of more lightly colored lines for all other models. Only models producing forecasts on a monthly basis are included. This means that some models whose forecasts appear in the Experimental Long-Lead Forecast Bulletin (produced by COLA) do not appear in the table. The anomalies shown are those with respect to the base period used to define the normals, which vary among the groups producing model forecasts. They have not been adjusted to anomalies with respect to a common base period. Discrepancies among the climatological SST resulting from differing base periods may be as high as a quarter of a degree C in the worst cases. Forecasters are encouraged to use the standard 1971-2000 period as the base period, or a period not very different from it. 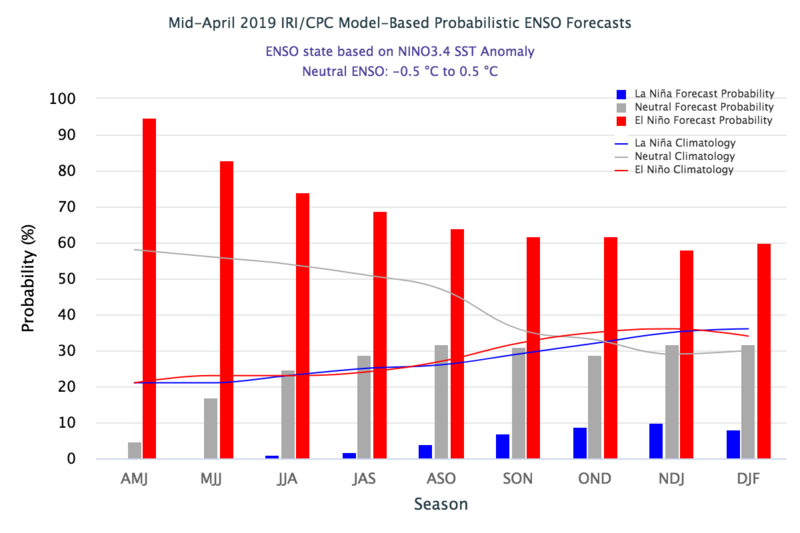 The official CPC/IRI ENSO probability forecast, based on a consensus of CPC and IRI forecasters. It is updated during the first half of the month, in association with the official CPC/IRI ENSO Diagnostic Discussion. It is based on observational and predictive information from early in the month and from the previous month. It uses human judgment in addition to model output, while the forecast shown in Fig. 3 relies solely on model output. Figure 1 is updated on this page on the second Thursday of every month. A purely objective ENSO probability forecast, based on regression, using as input the model predictions from the plume of dynamical and statistical forecasts shown in Fig. 4. Each of the forecasts is weighted equally. It is updated near or just after the middle of the month, using forecasts from the plume models that are run in the first half of the month. It does not use any human interpretation or judgment. Figure 3 is updated on the third Thursday of every month. Plume of forecasts of the Nino3.4 SST anomaly from dynamical and statistical models that are run during the first half of the month. A probability forecast is generated using all of the models in Fig. 4, and is shown in Fig. 3. The average of the forecasts of the dynamical models is shown by the thick yellow line, and of the statistical models by the thick green line. The average of the four models run at the NOAA Climate Prediction center (CPC) is shown by the thick pink line. This figure is updated on the third Thursday of every month. Because forecasts from some of the models shown in Fig. 4 are not yet available when the official CPC/IRI ENSO probability forecast (Fig. 1) is made, the official forecast uses as one of its inputs the Fig. 4 for the previous mid-month, which is shown in the CPC/IRI ENSO Diagnostic Discussion.